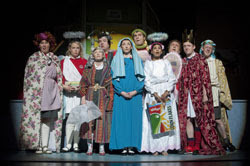 Having fond memories of watching Tim Firth's "Flint Street Nativity" on television some 10 years ago we were delighted to see that he had adapted it for the stage and localised it to Edinburgh as "The Corstorphine Road Nativity". Its premise of adults playing primary school aged children appealed - particularly as an impressive cast had been lined up. So why did we leave the theatre feeling more ho-hum than ho-ho-ho? The central conceit works well and we quickly accept the characters on stage as the youngsters - thanks in part to an impressive set design. We're gradually given an insight into the background of each child through chat and song, much of which is a bit hit and miss. A lot of the gags seemed to fall flat, particularly in the first half, and at times some of the humour was uncomfortable. I don't have a problem with that - some of the best comedy should make the audience uncomfortable, but here it was treading a dangerous line allowing significant portions of the audience laughs at the expense of a child with a lisp. Similarly, a few moments of race related humour didn't, for me, pass the 'laughing at' vs 'laughing with' test. Of course the question then becomes whether that is a problem with the writing or the audience. Much of the rest of the humour is pretty obvious stuff, and at times I did think I'd be better off at a genuine primary school nativity - and certainly more entertained by a 'You've Been Framed' style compilation of them. And disappointingly the Edinburgh references seemed largely of a 'insert local reference here' style rather than a significant reworking. What should pull the show through are the characters, but for the most part they aren't given much depth - perhaps because there are so many of them. Julie Wilson Nimmo impresses as Mary and her duet with Ryan Fletcher was the highlight of the carol parodies, while Gail Watson shines throughout as "Shepherd". But there are elements that do work. The gradually revealed impact of parental influence/neglect on each child does hit home, just not as hard as it would if we cared more about the characters, and at times it all feels very calculated. Although there were clearly many in the audience who were enjoying the show considerably more than we were, I don't think our party of three was alone in being underwhelmed by it. £25 for a seat to watch 2nd rate comedy although the cast were ok I suppose; I think it was meant to be funny. Although I am no prude some of the content was I feel unsuitable. As a proud scot I feel we were portrayed as bit of a simple breed. No I woudn't go again, I think my money would be better spent elswhere. We wouldn't disagree with most of your comment, although I think we would give it the benefit of the doubt that the simplicity was more about them being children than a slight on the Scots. But 'ouch' for the £25 ticket price - we were unhappy enough having paid £14 for the Saturday matinee! It was awful. I am a primary teacher and thought it should be very funny. The cast overplayed their parts and the few jokes were repeated to death. I left at the interval and I was not alone. A waste of money. "Review of the Year - 2009"